4----------the phantagraph---------- The loves, the joys they might have known, The seeds of good they might have sown, The flags of right they might have flown. This sacrifice, O God. These are your altars, Man, And this you sacrifice; What is the world you plan For this your sacrifice? (Venard McLaughlin, the author of the above, admits freely that it is by no means a great piece of work. But we publish it because it does have certain feeling. 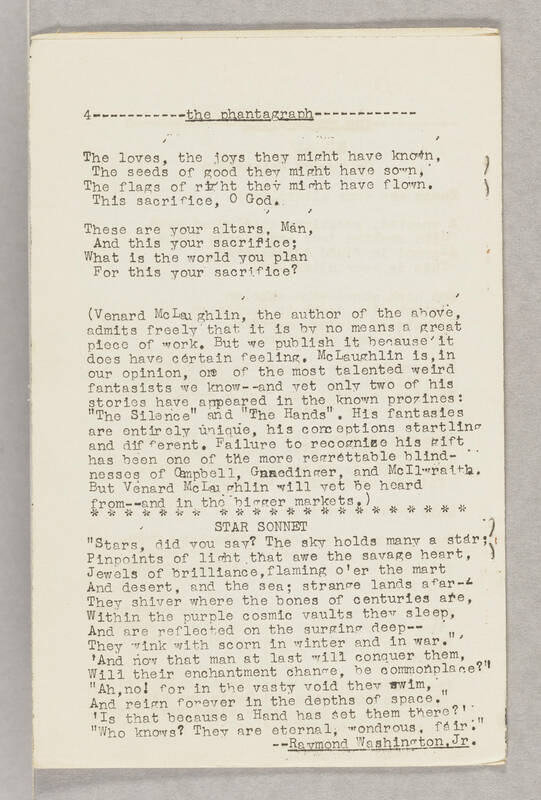 McLaughlin is, in our opinion, one of the most talented weird fantasists we know--and yet only two of his stories have appeared in the known prosiness: "The Silence" and "The Hands". His fantasies are entirely unique, his conceptions startling and different. Failure to recognize his gift has been one of the more regrettable blindnesses of Campbell, [illegible], and McIlwraith. from--and in the bigger markets.) STAR SONNET "Stars, did you say? The sky holds many a star; Pinpoints of light that awe the savage heart, Jewels of brilliance, flaming o'er the mar And desert, and the sea; strange lands afar-- They shiver where the bones of centuries are, Within the purple cosmic vaults they sleep, And are reflected on the surging deep-- They wink with scorn in winter and in war." "And now that man at last will conquer them, Will their enchantment change, be commonplace?" "Ah, no! for in the vasty void they swim, And reign forever in the depths of space." "Is that because a Hand has set them there?" "Who knows? They are eternal, wondrous, fair." --Raymond Washington, Jr.